O Ya's Tim Cushman offers guidance for sushi-curious home cooks. 1. Don't be ashamed to buy rice. Sushi rice can take a long time to master. If you have seen Jiro Dreams of Sushi, you know it can be taken very seriously. Cushman suggests simplifying the process by purchasing it cooked from your local sushi restaurant or Whole Foods. 2. Make friends with your fishmonger. It's the best way to score the freshest sushi-grade fish. The better the relationship, the better the fish. 3. Use a terrifyingly sharp knife. If your knife is dull, you'll stand no chance of cutting cleanly. If you don't have a sharp knife on hand, you can ask the fishmonger to cut the fish before packing. 4. Know that rolling is optional. If you don't have a bamboo mat, or just aren't proficient in shaping rice for nigiri, don't abandon the whole enterprise. Put sashimi in a bowl with rice, and use sliced nori as a garnish. 5. Dress it up. 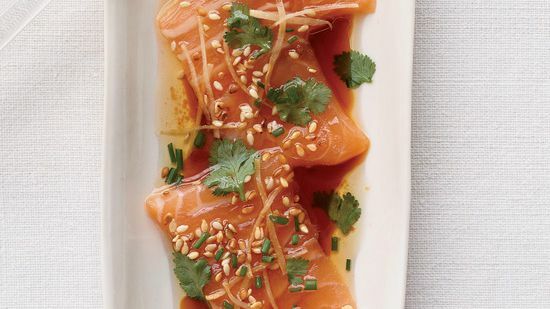 Try Cushman's Salmon Sushi with Ginger and Hot Sesame Oil with or without rice!